Nestled in the heart of Austin, one of the most vibrant and exciting cities in America, the Jackson School of Geosciences offers an education second to none. With more than 50 faculty members and 100 research scientists spread across three world-class academic and research units, students at the Jackson School have a unique opportunity to learn about a wide array of geosciences from scientists considered leaders in their fields. As the world’s largest academic geosciences community with dozens of state-of-the-art lab facilities, the school offers opportunities to collaborate on science that cuts across disciplines. Here students have a chance to work with scientists at the Jackson School, throughout the university and with our partners around the country and the world. Geoscientists study every part of the Earth, from the core, to the surface, to the atmosphere, and even other planetary bodies throughout the solar system. That work means geoscientists are crucial to solving big issues that face society today, whether they deal with water, energy, or the environment. Earth is calling. Will you answer? 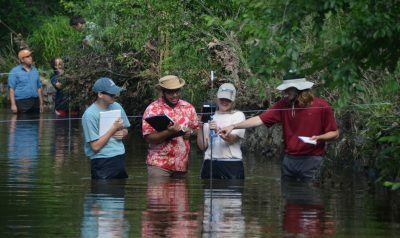 Education at the Jackson School provides real-world experience that actively engages students in field work, lab work and research. The goal is to prepare students to excel and become leaders in the geosciences, whether their career path takes them into industry, academics, government or the non-profit sector. The school’s large and active alumni network provides students with access to professionals and industry leaders that can help with professional development, advice, networking and mentoring. And our financial packages are some of the best in the country. Want to study the Earth? Find your future? Make a difference? Do it all at the highly ranked Jackson School of Geosciences. We offer an unparalleled undergraduate experience featuring the benefits of a small college within a major university. This is an exciting time to pursue graduate studies at the Jackson School. Already one of the largest and most prestigious Earth science programs, since 2008 we have added 18 new faculty members, an increase of more than 50 percent.